Knowing I shouldn’t be taking Peat hunting until he’s “ready,” I took him anyway. He’d demonstrated some troubling tendencies that needed to be dealt with: obviously, running off with stolen birds, but also busting and chasing birds, and appearing on the cusp of learning the joys of hunting for himself. My first Brittany, Glenna, was a masterful hunter for herself, which caused me to quit hunting until she died. Still, I took Peat out yesterday, with Angus and Leslie. Leslie had the leash, and I thought she’d be able to control him if Angus got birdy. The problem with this idea was that as soon as we set out, Peat sprinted an arrow straight course for 200 yards across a boulder-strewn field and stopped on a dime. He was pointing. I mean, he literally jumped out of the pickup and sprinted straight to a covey of Huns. It took him fifteen seconds. Angus was birdy, but doing his normal quartering. Peat had him beat by several minutes. I hustled toward Peat. As I neared, he actually turned his head toward us, almost as if to say, “What took you so long, and exactly what am I supposed to do now?” Just before I was within range, the birds busted, and Peat followed them and would not come back. So Leslie leashed Peat and wrangled him back to the truck. I’ve been working with him, trying to do a force-retrieve, which has revealed to me the extent of his stubbornness (see the video below). We’re starting to collar-condition him, too, so we can gain control over this diamond in the rough. I mean, his nose is staggeringly good, his athleticism and prey drive are phenomenal, and he is figuring out what the game is. But this was his last hunt, probably for the season. It breaks my heart to leave him at home (which I did today), but I’m trying to think of the investment. So I got to hunt with Angus alone today. Leslie’s staying home and exercising Peat, so I apologize for the dearth of winning photos and video. I miss her company on our hikes, too. But Angus found seven coveys today, Huns and chukars, and did some good retrieving work on crippled birds. It was windier than Trump at a Knucklehead Convention, but my old boy crept his way in on everything. He’s limping a bit after our journey today. It’s sad to think of him being past the halfway point. It seems like just a year or so ago we discovered this pastime together. 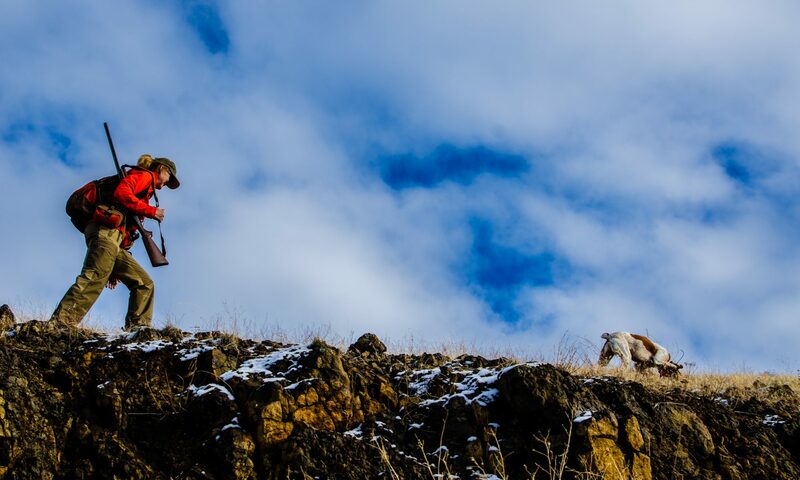 Time flies when you’re chukar hunting. So, I hope I can stick to the plan of working with Peat every day and keep him from the field. So far he’s making quite unremarkable progress. I won’t hold my breath. Wow! Your pup is giving you a run for your money. I’ve had a couple dogs like that and the good news is that they turned out to be my best dogs. I started hunting them alone and they began to learn about the partnership aspect .Over time they learned that it is a team thing. Right now it sounds like the pup is trying to get to the birds first, before Angus that is. Maybe you could try working them alone, one at a time until he gets it figured out. Don’t know if this will work for you but it worked for me. After awhile, I could hunt them together. In the meantime, good luck with patience. The very stubbornness that you see now may be a sign of a dog that never quits and can hunt all day. I don’t claim to be an expert but it sounds like you’ve given this a start already. Alan makes very good observations about the competition and teamwork. Patience is the key to training a dog especially a Britany (they are very sensitive). Get rid of the E-collar. Stop using treats as rewards. I found wonderful guidance from Ed Bailey, who wrote a short piece on how to get a dog to fetch without the “force”. If you would like a copy I would be happy to email it your way. It would be the best investment you could make in Peat, to read Ed’s words. I love your Blog. Thanks, Alan. We’re working with him. Here’s hoping you’re right (I think you are). Thanks, Dustin. We’re trying a few things. I hope we see progress soon. He’s a stubborn little bugger. Patience and repetition are the key words. He appears to have the nose and the drive to make a good hunter. Developing the partnership concept will come with practice. I think you have the most important factor in making a bird dog….birds. I would (like stated above) start hunting with just him. Only shoot (or shoot at, in my personal case) pointed birds and I bet he’ll figure it out. But im not a pro, so take that with a grain of salt. I bet you can make Peat into a great dog. I agree with Alan, hunt him alone until he hunts with you as a team. And a training collar Is probably essential to Peat believing that working with you is not only fun, there is no other option. If you’re soliciting advice, mine is take Peat to a pro. You may already know this, but Richard Robertson in Payette is nationally known. I mean he’s run dogs at the National Championship for many years. I think he recently retired from dog trialing and just trains dogs now. If I lived in Boise (one day maybe) he is who I would use. He has plenty of real estate and wild birds which are things most trainers don’t have. He has a website and Facebook page–Robertson Kennels. You’ll just have to buy the Johnny Walker instead of the Macallan 12 for a few months. Thanks, Andrew. Not sure I can swing subbing a blend for a good malt, but time will tell if my patience is up to the task. Thanks for your comments! Force retrieve is an art that takes years of experience with hundreds of dogs and should only be done by a professional. Each dog has his own personality and temperament being able to read these is critical. Archie Obrien Kennels Roseville Ca. Owner Trainer Earl Wood give him a call he will be glad to help. After his 6 week course you wont believe its the same dog. Bob I just watched the video on force retrieve. That is great work for the puppy keep it up. But by no stretch of the imagination is to be mistaken for the force retrieve process. There is only one video which I have found shows the full process Training gun dogs to retrieve by Delmar Smith. Bob, Sorry to hear that Peat is grounded for a while but it sounds like it’s for the best. When patience starts getting tested it’s best to back off. I know how gratifying it can be to hunt with two dogs and watch them work together and I have also been on the other extreme. It’s obvious by your pics and video’s that you have what it takes to produce a great hunting dog.